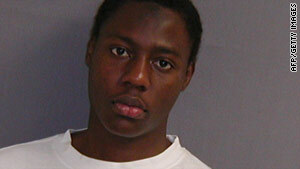 Umar Farouk AbdulMutallab has now been charged on six counts by a U.S. Grand Jury. Sanaa, Yemen (CNN) -- A terror suspect in the attempted bombing of a U.S. jetliner was radicalized in Britain, but did meet with a radical Muslim Cleric in Yemen, a top government official said Thursday. The meeting between Umar Farouk AbdulMutallab and cleric Anwar al-Awlaki took place in Shabwa, about 290 kilometers (180 miles) southeast of the capital, Sanaa, according to Yemen's Deputy Prime Minister for Defense and Security Rashad Al-Alemi. No other details about the encounter were immediately available. U.S. intelligence officials have been evaluating whether al-Awlaki played a role in the botched attempt to blow up a Northwest Airlines passenger jet en route from Amsterdam, Netherlands to Detroit, Michigan on Christmas Day. The attempt to ignite explosives hidden in AbdulMutallab's underwear failed to bring down the plane. A federal grand jury indicted AbdulMutallab Wednesday on six counts, including an attempt to murder the other 289 people aboard. AbdulMutallab had been flagged by federal agents who were getting ready to meet his plane when it landed in Detroit, according to a U.S. official briefed on the investigation into the botched Christmas Day terrorist attack. Al-Alemi emphasized at Thursday's news conference that AbdulMutallab lived in Yemen, but did not pick up his radical views there, instead saying that happen when he resided in Britain between 2005 and 2008. "This Nigerian guy came to Yemen in 2004 and 2005 to study Arabic and lived one year in Yemen," Al-Alemi said. "From 2004 to 2005, he didn't have any kind of links to extremism and radicals. "From 2005 on, he was absorbed by extremists in Britain, that is the reason he was not able to come back to Britain," he continued. "Yemen was not informed by the U.S. or British authorities that there were concerns about him." Al-Alemi didn't say when the meeting between AbdulMutallab and Al-Awlaki took place. Asked whether AbdulMutallab was recruited by al Qaeda in London, a Metropolitan police official in Britain replied "no comment." British Home Secretary Alan Johnson said Tuesday the British government had no evidence that AbdulMutallab had been planning an attack, and believes he was "radicalized" after he left Britain. British security services investigated AbdulMutallab's communications with UK-based individuals they had under observation while he was living in London, but judged that he did not then pose a danger. Those individuals were among 2,000 terror suspects British security agencies currently keep watch over, according to a senior British counter-terrorism source. Al-Awlaki's name also surfaced in November when U.S. officials revealed he and Maj. Nidal Malik Hasan -- the U.S. Army psychiatrist accused of fatally shooting 13 people at Fort Hood, Texas, on November 5 -- had exchanged e-mails. The intercepted e-mails between the two, officials said, had not set off alarm bells. The cleric recently told Al Jazeera's Arabic-language Web site that he had been in touch with Hasan in recent years. In that interview, al-Awlaki said he met Hasan nine years ago while serving as an imam at a mosque in the Washington area. The cleric said Hasan communicated with him via e-mail starting about a year before the shooting rampage -- seeking advice about killing U.S. troops, the cleric said. The 9/11 Commission Report says al-Awlaki had contact with two of the 9/11 hijackers while they were in the United States, though there is no evidence he knew of the plot. Al-Awlaki is believed to have fled to Yemen in 2003 or 2004. Since then, he has been referred to as a "rock star" by some of those who incite radicalism on the Internet. His current whereabouts are unknown to U.S. officials. Some have speculated that he was killed in a recent strike on suspected jihadist hideouts in Yemen. But a U.S. official said the intelligence community believes al-Awlaki is alive. His own family was quoted last week as having said the same thing. He may have been among al Qaeda operatives targeted in a December 24 airstrike in Yemen that killed some 30 militants, the Yemen news agency SABA reported at the time of the attack.